As the major force of sand and stone aggregate production line, sand making machine is an indispensable equipment in sand production line. It is widely applied for the crushing of various kinds of rock, cement, refractory materials, aluminum clinker, emery, glass raw materials, construction machinery sand, stone and a variety of metallurgical slag, especially on silicon carbide, emery, sintered bauxite, magnesia and other hardness and abrasion resistance material，its output efficiency is higher than that of other types of crusher. Artificial sand due to its own characteristics, its applications are better than the ordinary natural sand, so the demand for sand making machine is also increased. 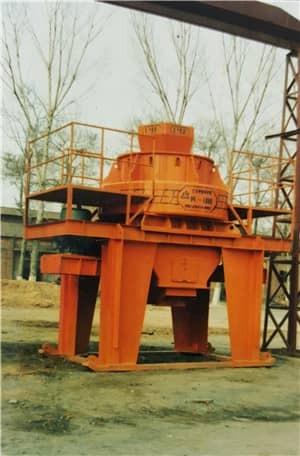 PLS sand making machine manufactured by Luoyang Dahua attracted much attention after its launched out in 1989. Through decades of innovation and development, PLS sand making machine keeps pace with the time, has been improved from the first generation to the third generation. The appearance is more beautiful, and the performance is more excellent. The machine has "stone-beat-stone" and "stone-beat-iron" two crushing cavity, the "stone-beat-iron" crushing cavity is used for the crushing of medium hardness rock, with sand production rate around 40-60%. PLS sand-making machine with deep cavity impeller design can reduce energy consumption, increase throughput and improve yield. Special spindle transmission structure and speed ensure the equipment running smoothly and reliably at high speed. At the same time, automatic monitoring system can be optional to ensure timely monitoring and safe operation of the equipment. According to the different processing materials, wearing parts can be customized designed, has longer service life, and lower operating costs. Next Article: What is the Output of the Sand Making Machine Related to?